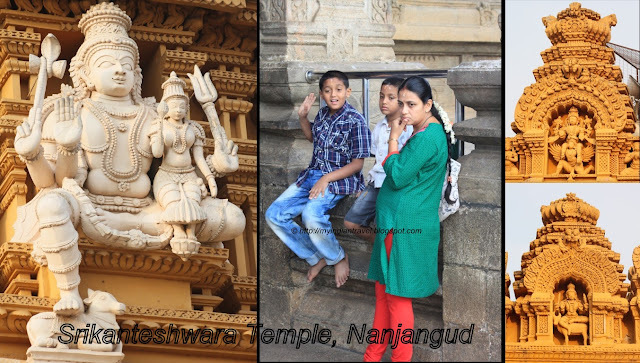 Srikanteshwara Temple at Nanjangud on the banks of river Kapila is an ancient temple dedicated to Lord Shiva. The temple was intially built by Chola Kings in the 11th – 12th century. Later Hoysala and the Vijayanagara dynasty kings further developed it. The temple was developed on a full scale during the reign of Krishna Raja Wodeyar. This big temple and measures 385 feet by 160 feet in dimension. The outer walls of the temple are about 12 feet high. The beautifully carved huge tower on top of main entrance has seven stages. On top of it there are seven gold plated Kalasas flanked by two horns. The interiors of temple is beautifully carved with several scupltures of dieties Shiva, Subramanya, Parvati, Chandikeshvara and Ganapathi. The pillars are carved with beautiful sculptures. Even on the exterior walls of the temple there are beautiful sculptures. That second shot is just stunning! Magnificent temple, very nice sculptures. Wonderful captures of the beautiful temple. Boa tarde, o templo é maravilhoso, as belas fotos mostram na perfeição os detalhes da beleza. Magnificently looking temple in gold coat! The sculptures and carvings on both the pillars and temple tower were pretty neat and enhances for view. Really splendid architecture and so well preserved.....the top looks incredible! I never cease to be amazed by the artistry and skill of ancient people around the world. It looks like it is sculpted out of pure gold! Just beautiful. Your family looks well! The temple looks as if it is carved out of pure gold! Beautiful. Enjoyed seeing your family as well. I love the view of the entire Temple in the first photo. The close-up of the Gopuram is a feast for our eyes. Amazing! Hard to believe someone could build something to big and intricate without modern equipment. Wow - gorgeous temple sculptures! The statues, sculptures and architecture of this temple are all exquisite! Amazingly beautiful carvings on the temple. As I say every week, it seems, these temples are truly amazing. that seems a very large building... i guess the inside is beautiful too? this is so ornate. and HUGE! Stunning gopuras! Wonder how long they might have taken to built this temple during those days! You truly are a master in your art- each time, every time!